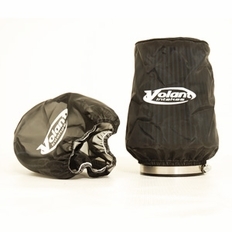 Volant Pre-Filters are manufactured from highly durable polyester. Uniform micron openings allow the filtering of debris .005� or larger. The Volant Pre-Filter is also factory treated using an embedded hydrophobic process. This offers consistent airflow, water repellency and maintains horsepower gains. Simply put, the Volant Pre-Filter keeps larger water and dirt particles out, but allows smaller air particles to pass through it (Please note that this item is water repellent, not water proof). The Volant Pre-Filter drastically improves filter life and the time you can go between cleanings, especially for people using Volant Ram Air Scoops or doing off road driving.